Healthcare.gov stores the minimum amount of data? : Is There A Problem Here? : Healthcare.gov stores the minimum amount of data? Healthcare.gov stores the minimum amount of data? 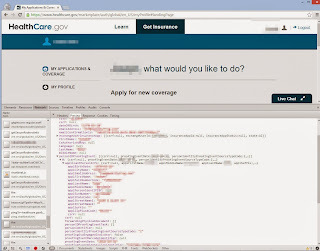 I have heard some say that Healthcare.gov doesn't contain much personal information. Let's take a look. The list below contains some of the data items that Healthcare.gov returns to the browser each time a user logs into the system and views their application. As I haven't yet successfully completed an application due to other issues with the system, I don't know if all of these get populated. The items I have been able to successfully enter into a form and submit do get returned the next time I login. While a user must login to access this data, this list does give us a hint as to what kind of data might be available to someone who manages to access another's account without authorization. Given the sheer volume of personal information to which Healthcare.gov at least has access, security should be made a top priority. This is only "some" of the data?!? pregnancyIndicator, memberEmployer, ... ?